Their estimated time of arrival in Anda will be around 7-8PM on Sunday, November 29, where a short ecumenical ritual will take place to cap the pilgrimage. Walkers from the Bohol Outdoor Adventure Team (BOAT) will serve as team guides and navigators, while the registered nurses form the medics team. The Walk Plan prepared by BOAT and approved by the core walkers of Bagtas Lunhaw. The Bohol Climate Walkers, multisectoral, of varied professions and persuasions, are Atty. Alma E. Aparece, April Monte de Ramos Aquino, Beryl Elizabeth L. Guday, Edeliza V. Macalandag, Fred Jordan T. Carnice, Jammy Lou Ungab, Jessie James A. Rollorata, Ludwig Bon M. Quirog, Marjune F. Placencia, Mark Steward S. Moring, Marlon Q. Abucejo, Mehul Dabhi, Melody C. Redillas, Noelyn S. Dano, Richard Jeanjaquet, Jr., and Sherwin D. Sandulan. 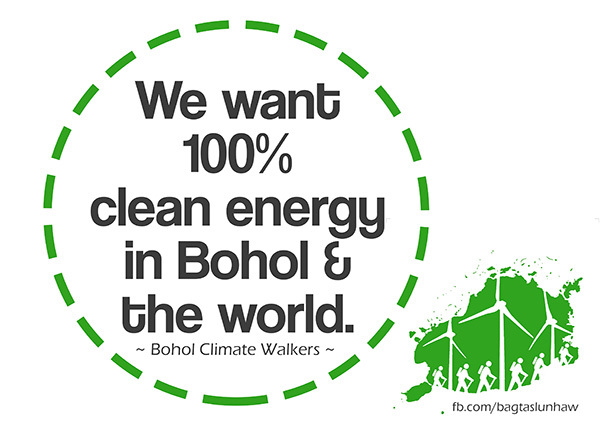 In the position statement signed by the walkers, they’re advocating for Bohol’s conversion to renewable sources of energy. This expedition is registered with the People’s Pilgrimage, a worldwide movement of people – of all faiths and none – who are taking their own journeys, big and small, to visit the places at the heart of the climate crisis at risk or affected already, or places that demonstrate inspiring solutions for a fossil-free future. It, however, remains independent and non-aligned, mostly self-funded, and partially supported by friends of the Bohol Climate Walkers. Similar walks calling for climate action are currently going on worldwide to coincide with the start of the United Nations Climate Change Conference or COP21, the annual meeting of all countries for the climate, which, this year, takes place in Paris, France on November 30 to December 11. In the Philippines, climate pilgrimages in Negros Island, Cebu, Albay, Manila, Mindoro and many others are also in full swing. Naderev “Yeb” Saño, former climate envoy of the Philippines, spearheads the main pilgrimage – a historic 1,500-kilometer walk from Rome, Italy to Paris, France. The People’s Pilgrimage is launched by Our Voices, a multifaith climate network. For more information on the People’s Pilgrimage, visit http://peoplespilgrimage.org/.